Kuwait Airways will launch its new Terminal Four (T4) on Wednesday morning in a flight to Bahrain. The Manama-bound flight will mark the official operation of T4, which would be fully operational by end of August. T4, inaugurated by His Highness the Amir Sheikh Sabah Al-Ahmad Al-Jaber Al-Sabah on July 4, is part of the Directorate General of Civil Aviation's (DGCA) strategy to transform Kuwait into a commercial and financial hub in line with the 2035 vision. The USD 173.2 million new terminal consists of state-of-art technology and internationally-approved security system. Kuwait Airways had said T4 would be fully dedicated for the national carrier thus reduce the pressure on Terminal One (T1). It said its 25-plane fleet would be using T4 to transport 4.6 million passengers by end of this year. Kuwait Airways will be operating 33,600 flights every year to 43 cities in 26 countries. 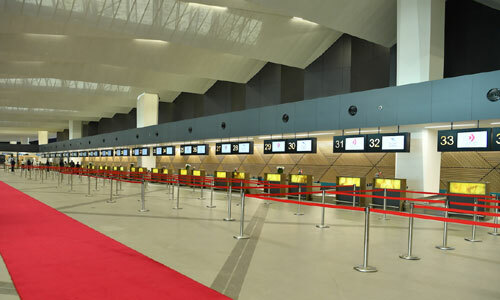 The 55,000-square-meter T4 includes 14 gates for departure and 10 for arrivals. The new terminal will host around 4.5 million passengers every year, includes a parking lot for over 2,000 cars, 20 checking counters and special counter for people with special needs, and a duty free. T4 will provide around 2,000 jobs with revenues projected at USD 60 million per year. Kuwait Airways opened Mubarakiya Lounge at T4 for the first and business class passengers. The 426-square-meter two-storey lounge includes 113 seats, 10 TV screens, a business center and a buffet. Kuwait Airways was established in 1953 and became fully owned by Kuwait government in 1962. Indiansinkuwait has been doing a great service by such public service announcements. Will it also a google map showing the location? The terminal looks excellent, we hope that the passenger experience with Kuwait Airways also improves in a similar proportion. It should not happen that there are 30-40 counters but only two are operational at any given time resulting in a total mess as chaos. before. The damn care attitude of the handling staff has to change if Kuwait Airways wants to regain its lost glory. Mabrook. Congratulation T4 Team and Kuwait Government.